Lately, I’ve been thoroughly enjoying the Slow Home Podcast, which changed my life last summer when they encouraged a screen-free bedroom experiment. I stopped bringing my phone into the bedroom with me at night, and have since enjoyed better sleep, easier waking up in the morning, and less dependence on the wretched little machine. It kick-started a real push for me to stay away from my “smart” phone more and more. I leave it in the house instead of worrying about Instagramming my chickens. I don’t have it with me while I watch TV, which means I just watch TV again. TV shows are suddenly more coherent, more engaging, more enjoyable, as if somebody worked hard to entertain me with this show. Imagine that. On a recent road trip across the state, I found myself frustrated with Google Maps, which did deliver us safely to our destinations, but couldn’t help me figure out how far we were from a few places that weren’t on our route. I found myself longing for the big book full of road maps that I remember leafing through as a child while we drove through the endless country roads, orientating myself by flipping it upside down. Now, I pinched at my iPhone screen, while the device itself got so hot with the effort of navigating that I had to put it down, trying to zoom out, zoom in, pan across the terrain, but with such terrible phone signal in the hills, all it could show me were grey pixels. There’s now a road atlas on my Amazon wishlist. The glamour of my life overwhelms me at times. I print recipes that I find so I can collect them in a paper binder, instead of a Pinterest board. I was sick of having to find a clean, dry space in my minuscule kitchen for an electronic device, and sick of my buttery, floury fingers having to unlock screens every five seconds. Now I spill and smudge all over the paper, and I don’t care. Neither does the paper. 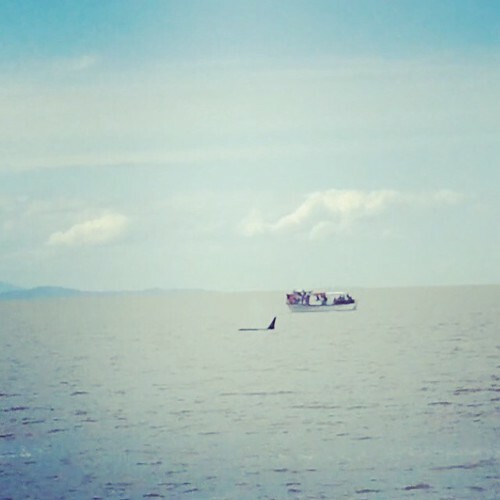 It hit me hard when we went out into the bay a few weeks ago on a whale watching tour. We were lucky enough for a transient orca group to show up, and one big male was alone when we came upon him. He came so close to the boat that the engines were turned off, and I heard two heartbreaking sounds. The first was the sound of him singing. As he passed beneath our boat, I could hear him calling. I had just been at the Whale Museum in Friday Harbour where I had learned that the noise pollution in the ocean had meant a lot of whales have just given up singing to each other. I listened to his calls while my heart leapt up into my throat. I wanted to cry, humbled by the moment. I thought of how quickly our engines would be turned back on, and how this wonderful beast would roll his orca eyes and give up his song. The second sound was the collection of bleeps, clicks, plinks, and notification alerts from everybody’s phones as they scrambled to Instagram him. I was guilty of it too, though I stopped snapping photos and decided to just video everything with one shaky hand while I watched with my own eyes, and planned to pull stills from my video files later. After a while, I just put my phone back in my pocket, and I just watched the orcas. Better to just be there with them, than to be constantly mediated by the screen and this absurd fear of missing out if we don’t record everything immediately. The cowboy and I reminisce about the good old days of mix tapes, recorded off the radio; we wonder why people can’t just speculate about things without having to google it immediately. We look for the pirate radio station of an evening which broadcasts crackly old bluegrass music on old style radio equipment, and which we can only pick up from certain roads in the county while we drive home. I’m developing a taste for vintage and antique items – and reproductions just won’t do any longer. I don’t want something that has been “antiqued” to look old. If I want a shabby-looking canister for my kitchen, it had better be shabby-looking because somebody else has used it and loved it for years already. I want second-hand everything. I want reuseable everything. I imagine my consumerism stopping dead in its tracks, and never purchasing another new item in my life. It’s unlikely. I often day dream about the apocalypse, though – not the fire and brimstone kind, but the kind where electricity and technology fail us. The kind where we have to speak to each other again, share skills and resources, read books and be creative. The first places I’ll be looting are the library and the antique shops. I write letters by hand, now. I find a sense of comfort in handwriting a cheque to put into the mail instead of an online payment. I like going to the bank in the small town nearby to have a chat with the tellers rather than using the smartphone app. How sustainable is it to live with one foot hooked in the past, though? As small business owners, we can’t afford not to be on social media. Living across the planet from my family means I can’t afford not to be connected through the internet and the joys of technology that allow us to speak, face to face, almost whenever we want to. There’s no denying the advances in technology that have made health care better and better. I just can’t help but feel that it’s ruining our lives. We’re more connected than ever, but it’s all just disconnection. What’s real? The little red circles that demand attention, or the warm earth under my feet when I step out, barefoot, into the yard? glamour is an illusion that conceals flaws and distractions.